Tales from a tribble: The First Family's Sequester Sacrifice? The First Family's Sequester Sacrifice? Hat tip: A great American, my Aunt Carla from St. Louis. President Obama always lectures us on how he needs to pay more in taxes [of course, when push comes to shove he takes every single deduction possible to lower his taxes] because he is in that bracket of "evil, ungrateful" Americans that are not paying their fair share. The president feels bad about paying a less percentage than Warren Buffet's underpaid secretary. Hey Mr. Prez, I've got a better idea. You and the first lady start taking vacations that don't cost any more than Warren Buffet's underpaid secretary's vacation [if the evil Buffet even allows her to go on vacation]. You can call it "the first family's sequester sacrifice". Maybe if you and Michelle only spend $50 million on your vacation, then you can let kids back in the White House to tour again. 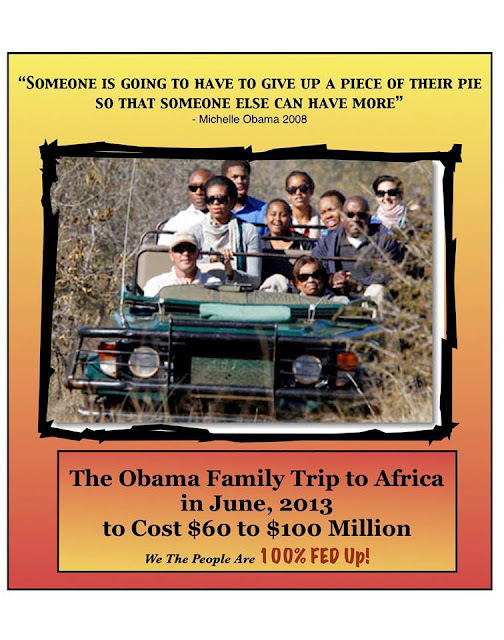 I wondered what the sequester looked like from Kenya! I think you have a long wait brother for it to get to you. And do I hope someone takes you up on that hint DB!